They were met with a view of a large garden, but unlike the welcoming front of the house, now flowers bloomed and no bumblebees buzzed. Everything was dark and drenched in shadow because of what lay to the left – a gigantic tree that loomed over the entire garden and the house itself. Immy’s breath caught in her throat and her heart began to race as her eyes slowly travelled up its thick, gnarled trunk. When Immy and her parents travel to England for a fresh start, they desperately want to rent a country cottage with a garden. But the only house that meets their brief has a downside: a mysterious mulberry tree in its backyard. Village lore has it that the tree is responsible for the disappearance of two girls, each of whom vanished on the eve of her eleventh birthday. Although the two disappearances were almost two hundred years apart, the legend surrounding the tree is such that the whole village mistrusts the tree, and girls are kept well away. But Immy’s parents don’t believe the tales, and Immy herself feels drawn to the cottage and to the mystery of the tree, and soon the family is trying to rebuild their lives in their new home. Still, as Immy’s eleventh birthday draws close, and Immy hears and sees things that aren’t really there, she wonders if she can solve the mystery or if she, too, will fall victim to the tree. The Mulberry Tree is an engaging, but eerie novel for younger readers, who will love th supernatural elements. The blend of creepy, frightening moments with realistic, everyday problems and warm moments is a satisfying mix, suitable for middle and primary aged readers. The English setting will also appeal, adding tot he sense of displacement felt by the protagonist and adding interest for the reader. Twelve years ago Ruth Black’s husband was killed in mysterious war-time circumstances. Since then she has built herself a new life, resettling in rural Western Australia and forging a career as a novelist. But the arrival of her Aunt Julia heralds the start of a series of unsettling events. Julia has travelled from England to warn her niece that she has forseen her murder. Ruth is not sure whether to believe her Aunt’s eerie premonition, but is startled by her knowledge of Ruth’s home, without ever having visited it. As events unfold, Ruth must take her Aunt’s warnings seriously – but how is she to stop her enemies, and who is she to trust? 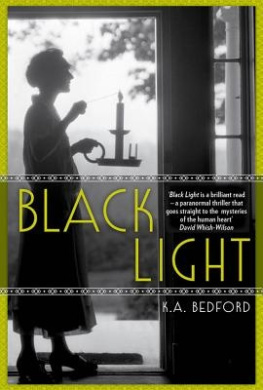 Black Light is a spine-tingling supernatural crime thriller, set in 1920s Western Australia. The town of Pelican River is fictional (though loosely modelled on Mandurah, south of Perth), and populated with an intriguing cast, including the eccentric Ruth herself; her widower neighbour Gordon, who copes with his grief by inventing things and surrounding himself with dogs; and a parish priest who believes Ruth is evil. An intriguing blend of mystery, thriller and the supernatural, Black Light is absorbing, though at times a little confusing. For example, Ruth – and it seems everyone else – is acceptant of the fact that elves populate the neighbourhood, and that Gordon can cast protection spells, but struggles with other paranormal or supernatural possibilities. Still, it is perhaps this unpredictability which make the book intriguing. Recommended for lovers of the paranormal. 1. It’s never wise to run in ten-centimetre platforms, no matter how well you think you can handle them. 2. My knowledge of the great outdoors is sadly lacking. Tents, for example, have ropes and things that can trip you up. Very easily. 3. My image of psychics wearing too much cheap jewellery and draped in floaty scarves may be way off but, like, since when did psychics look like surfer gods? Macey sees dead people. This would be disturbing enough, but when she realises the ghost-boy who’s visiting her isn’t actually dead yet, she has no idea what she’s supposed to do. If she doesn’t figure out how to help Nick she’s going to go crazy. Soon though, she realises that Nick isn’t her only problem. Her mother has walked out and her dad has come home with a whole other family for her to adapt to. The surfer god who’s masquerading as a psychic keeps popping up in her world. Oh, and maybe, just maybe, somebody is trying to kill her. Almost Dead is a wonderful mix of so many things: romance, humour, mystery, teenage angst, the supernatural, and more. So many elements could be overwhelming, but instead it is delightful. Macey is an engaging, quirky character who is likeable, strong and, at times, frustratingly independent. What happens t her is pretty scary but it’s also told with humour, in a satisfying mix. Suitable for teen readers, Almost Dead can be read as a sequel to Dead, Actually, but equally well stands alone. 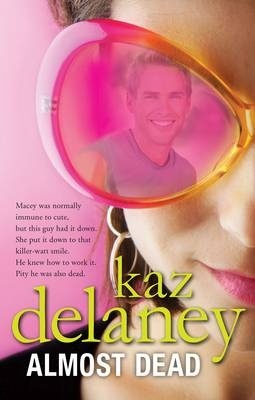 You can see an interview with Kaz Delaney here. Seeing a vampire isn’t all that unusual in New Whitby, given that the city was founded by vampires. But although Mel and her friends Cathy and Anna might have seen them before, they haven’t actually met one. Vampires tend to stick to their own kind, and their aversion to light means they tend to be awake and active when humans are asleep. Then a vampire comes to their school, and suddenly everything is different, because Cathy is convinced that he is ‘the one’. Mel is determined to do whatever it takes to make Cathy see that dating a boy like Francis is dumb, but considering becoming a vampire to be with him is just sheer madness. Her efforts to save Cathy are complicated when she meets Kit, a human boy with an unusual upbrining. Mel’s anti-vampire sentiments are soon trheatening not just her friendship with Cathy, but also her connection with Kit. Team Human is an interesting take on the vampire book phenomenon. Taken as a parody of the form, it is clever and funny. Taken as a straight read, it also works – there is romance, mystery, suspense and character development. Whether teen readers will consider it a parody will depend on the reader, but because it works either way this is not a problem. I clutched at the doorframe. But still she stared at me. Her…A dead person. In my room. Let me clarify: not a body, a dead person. Willow’s having a bad week. A very bad week. Her parents have told her they’re heading off to start a church in Africa. The guys she has a crush on treats her like a little sister. And then there’s the matter of JoJo Grayson, a rich girl who inconveniently visited the drive through where willow was working – and then went and died, making Willow the last person to see her alive. This means that Willow is the one that JoJo is haunting, and JoJo isn’t any nicer dead than she was alive. She’s going to make Willow’s life very difficult until Willow can figure out what happened in the lead-up to JoJo’s death. In the meantime, Willow is suddenly popular. All of JoJo’s friends, the ‘in’ crowd, want to spend time with Willow, ostensibly to learn more about their dear departed friend. But Willow soon realises there are ulterior motives ta play. these people think Willow knows something – and they’re pretty keen to find out what it is. Dead, Actually is a tragi-comic story of life, death, and life after death – and of friendship and family, too. There’s a lot happening in Willow’s life apart from the haunting, with her woefully inadequate parents having invited a shyster evangelist into their home and her feelings for her best friend’s brother, Seth. This could be a lot to deal with in one story, but Delaney does it well with the story unfolding over just a few days and the characters delightfully drawn. Willow is an endearing first person narrator, outwardly strong but with her vulnerability helping to make her believable, and JoJo is the girl you love to hate (even after she’s dead) but who you come to understand just a bit better. Suitable for teen readers, Dead, Actually is a delightful blend of mystery, romance and the supernatural all wrapped up with comedy fiction.